A while ago I wrote a few notes in my trusty Info Select about "designing against the grain". That is designing a game that's a lot different from what you usually design, perhaps from what you like to play. I'm always a bit leary of this, as I've also written that if *you* don't like the game you design, why should anyone else? Maybe I should modify this latter to "if you dislike the game you design, why should anyone like it?" Because I have recently designed a game that I don't care to play, because it's abstract, but that has been very well received by my local playtesters. I like games that model reality, or "a reality" in the case of fantasy and science fiction. I want to be able to compare a move or play I'm making in the game with something that could happen in the (or a) real world. If I cannot, then I have trouble getting any interest in the game. I played chess when I was a kid, but gave it up at about age 15 because it was too much like work! Yet chess originally modelled warfare. In the end, it's my interest in history that combines with the interest in games. So I don't care for abstract games. Nonetheless, a few months ago I started with the premise that I wanted to design a game that uses the colored glass beads or "stones" that were originally made to decorate plants, but which now have many uses including games. At first I tried to come up with a system without chance that just used the stones, but that seemed too sterile., insufficiently varying. I didn't want to use dice, of course, or any overt chance mechanism, but I wanted more happening than you get in a "typical" abstract no-chance game such as Go or Chess. So I came up with the idea (used in Fluxx and, I suppose, other games) of varying the rules. There are cards for different victory conditions and different capture methods, plus some action cards, that players may have in their hands. Players can play the cards to change the victory and capture conditions of themselves or of other players, making for a rapidly-changing game. Because the game combines the positions of the stones on a hex board with the wild variance of the cards, I called the game "Law and Chaos"(TM). It is much shorter than my other games (30-40 minutes), and feels more "Euro" than my others (no one is really out of the game, surprises occur). I'm not a Euro fan. And I have been quite unable to come up with any theme for the game at all--to me it is purely abstract. I tried it first as a two-player game, which worked but didn't seem terribly exciting to me (the disliker of abstract games....). But when the local playtesters got hold of it, especially when they started playing with three players, it has turned out to be very popular and to be a "natural" three player game, where "kingmaking" is necessary, but difficult enough that it works out very well. We have found a second way to play (the Law way) that de-emphasizes the changes produced by the cards, and consequently rewards planning and "strategy" much more than the first (or Chaos) version, which rewards efficient reaction to frequently-changing conditions. At this point, then, "designing against the grain" has proved once again to be quite worthwhile. "The idea for a game is not protected by copyright. The same is true of the name or title given to the game and of the method or methods for playing it. As you can see, the ideas or systems of a game cannot be copyrighted, only the written expression can be. The Britannia game is copyrighted, hence no copy can be made that uses the words or pictures in it. However, if someone designed a game about British history from the Roman invasions to the Norman Conquest, and used many or even all of the ideas and techniques of Britannia, but used a different title (which may be trademarked), a different-looking board, and completely rewritten rules, it would be legal, however reprehensible it might otherwise be. 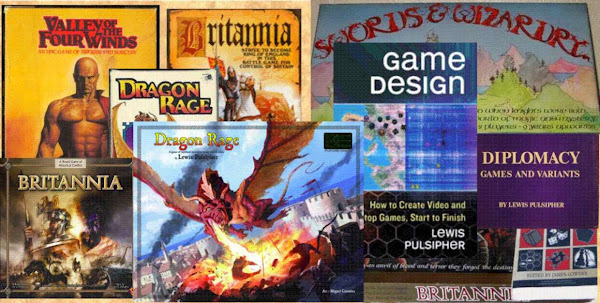 I have been aware of this for many, many years, as any experienced game designer is aware, and as has been described numerous times on numerous game designer Web sites and discussion groups. Moreover, I am very careful about my rights (which is why I long ago stopped writing for Dragon Magazine, because they decided to insist in buying all rights to articles, and still do). I would never sell any of my "game systems" to anyone even if I legally could. If anyone tells you that any person or company owns the rights to the "Britannia game system", they simply have no idea what they're talking about--please let me know about it. At PrezCon one of the game manufacturers told me about what he called the "collapse of the distributors". Along about 1995, distributor orders for wargames dropped drastically. At that time collectible card games were really big, and I understand from other information that in effect the CCGs took over the retail stores. This manufacturer now acts as their own distributor (and can actually make more money, as they got 40% of list from a distributor, but charge 54% of list directly to the retailer). This came to mind when talking with someone who preordered a copy of Brit in the Washington DC area. The store called him to come get his copy. While there he asked to buy another. Other than two other preorders, they had none! The store caters to miniatures gamers, boardgamers, and role players, but despite having three preorders for Brit had ordered (or at least, had received) no more. When he put in his preorder, he originally asked the clerk if they would stock Brit. "Uh, what company makes it". He said he thought it was the same company that made DOOM. "Oh, yes, we get all the FFG games". FFG is identified with role-playing, cards, and and fantasy in general, as well as with boardgames. So it's good fortune, from the point of view of introducing new people to the game, that it's published by a company that still has clout with distributors. Despite the experience with this particular store.